The Watchtower teaches that Jesus was resurrected as a spirit creature. 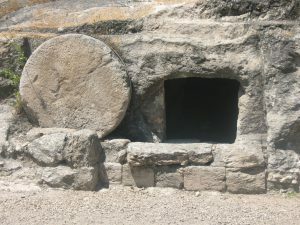 You can challenge this view of Jesus’ resurrection using soundbites. The first soundbite is a statement. The second is a question. The soundbite statement is this: In order for there to be a resurrection, something has to die and then come back to life again. The soundbite question is this: Regarding Jesus’ resurrection, according to the Watchtower, what was it that died and then came to life again? The “…and then came back to life again” is what will cause them problems. The Watchtower says it wasn’t Jesus’ body. That body was sacrificed and never came back to life again. It argues that if Jesus had taken back his fleshly body that would have been the same as taking back the sacrifice and reinstating sin debt that sacrifice had paid for. The Watchtower says it wasn’t Jesus’ spirit. The Watchtower teaches that human beings do not have souls. Rather, they are souls. That is, there is no such thing as a soul (the human personality—mind, will, and emotions) which has a separate existence from the body. Although the Watchtower speaks of the resurrection of dead human souls, that terminology can be challenged with a third soundbite: How can even God raise from the dead something that does not exist? What the Watchtower teaches isn’t really resurrection. If Jehovah’s Witnesses give you this convoluted explanation, point out that “life pattern” isn’t a biblical term. According to the Watchtower’s description, this “life pattern” isn’t some part of the individual that dies and then comes back to life again. Rather, it’s God’s recollection of the person’s personality and memories. In Watchtower teaching, using his own perfect memory, God re-created Jesus’ personality and memories and placed them into a spirit body that had no connection at all with his physical body that died. In summary, according to the Watchtower, what was the part of Jesus that died and then came back to life again? Have you ever brought these points up to Jehovah’s Witnesses? What was their response? If you were a Witness, how would you have responded? What Did Jesus Say Would Be Raised?